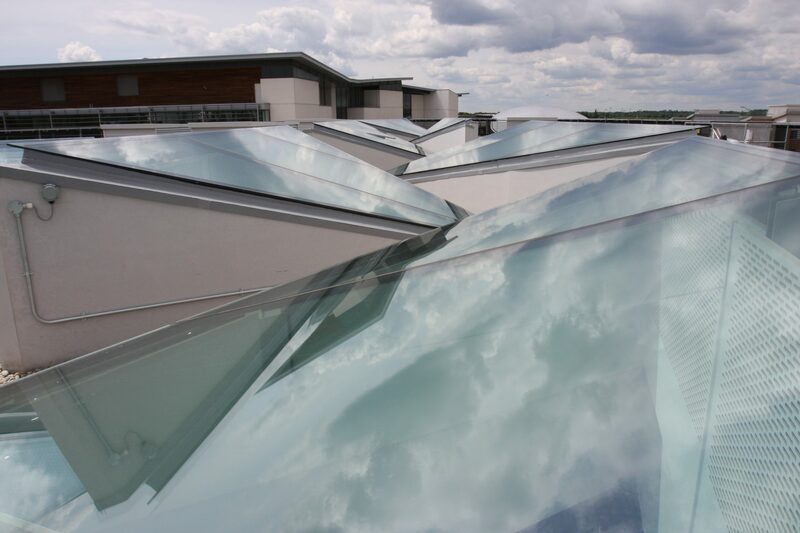 Projects designed, manufactured and installed a series of triangular, frameless roof lights to the new law building at the Hatfield campus of Hertfordshire University. Each triangular roof light was built onto a sloped upstand within the flat roof bringing light into the large stairway and lobby at many different angles. Metal ventilation panels were also built into the angled up stands for minimal and discrete ventilation through the space without the need to add framed ventilation elements into the glass structure itself. The structural glass roof lights were made from multiple glass panels silicone jointed together. Frameless glass beams in low iron glasswere chosen to support these glass joints, maintaining a frameless glass roof light design. Externally, the top layer of glass in the insulated glass units was stepped over the shaped upstands for a flat, flush exterior design to the frameless roof lights. The angles of the shaped upstands and the construction of the flat roof mean that the frameless roof lights are not visible from the outside of the building but the triangular roof lights within the roof create dramatic natural lighting throughout the new law building lobby and walkways.